Buoyed by the recent economic growth, all of us have an aspiration to see India as a developed country soon. Investment in infrastructure is considered the best bet to get there. Probably, we will get some distance with that strategy; but, I submit, only rooting out corruption can actually get us to the finishing line. 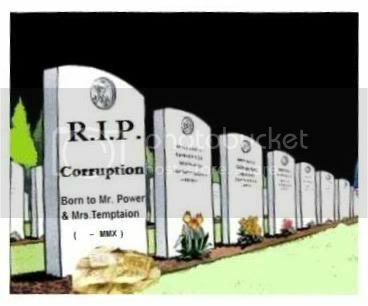 For, corruption has the evil ability to destroy the nation before any benefit of progress reaches the common man. But corruption is neither a new nor a simple phenomenon to conceive of its ending! In fact, Vedas called corruption a hydra-headed monster! Its heads are bribery, exploitative profit, vested interest, naked selfish desires, hypocrisy in the form of false promises, pride, false ego and calumny. It also takes the other forms like, officiousness, sycophancy, treachery, wickedness etc. If not controlled with true knowledge containing permanent truths, it spreads very fast in politics, economics and various organs of the state and institutions of the society. With such an overwhelming description, it is not possible to start exploring end of corruption. So, I chose a simpler definition articulated by Transparency International “the abuse of entrusted power for private gain”. Looking at it this way, the solution has just two components. Deal with power. Deal with gain. Turning to dealing with “gain”, paying more to those in power is an obvious solution, whether it is done as is by raising pay levels, or hedge through performance based pay that is commonly used in business! In effect, what could be lost if caught while taking bribe, should be more than what one gains through that bribe for a job done. In reality, the playing field is more complex than that. The minds of some of the greedy Wall Street executives became corrupt not because they were underpaid. Nor do many positions of power operate as “markets” to design pay per performance. We need to invoke the social norms to deal with this more complex situation. Ethics & Values must find more emphasis in education. After all that’s where it all begins. How do we deal with systemic corruption, that is deep rooted; almost institutionalised? Sequence and eliminate corruption sector by sector, start with education and taxation? Two sectors with potentially the biggest impact! With three cheers to “No Bribe” on its first anniversary in accomplishing its mission…. Thanks @S_Sivakumar. Your opinions, suggestions and constant encouragement have been a pillar of strength to us. The references forwarded by you and your unique summarisation of articles have been invaluable. This post is an excellent continuation of your commitment to the cause of uprooting Corruption in India. I read with awe Shri S Sivakumar’s brilliant piece on corruption! however mighty they may be , the corrupt are shameless, worse than thugs! We should stop respecting such counterfeit coins like Ketan Desai& one home secretary Ravi! All said and done, ‘No Bribe’ situation is a far cry in our kind of society. As said by Sivakumar,Ethics & Values are very important in fight against corruption. Overall social morality is going low day by day.We have to teach morality,ethics & values to young generation.Everyone should know the values of the sacrifies made by oir greate ancesters for our country. Ramdevbaba is doing a great work in taking our nation towards a corruption free,healthy tommorrow. Media should suppprt such good people and bring their work infront of society so that common people will inspire to fight against corruption. I want to join this group & the movement . I would like to be subscribed to the newsletters , articles & mails. Plz help me . @Anubhav, you could subscribe by using ‘subscribe’ near top right corner. You could also fan me at http://facebook.com/nobribe . Every Indian should voice his/her concern , because it is their right as well as a duty.